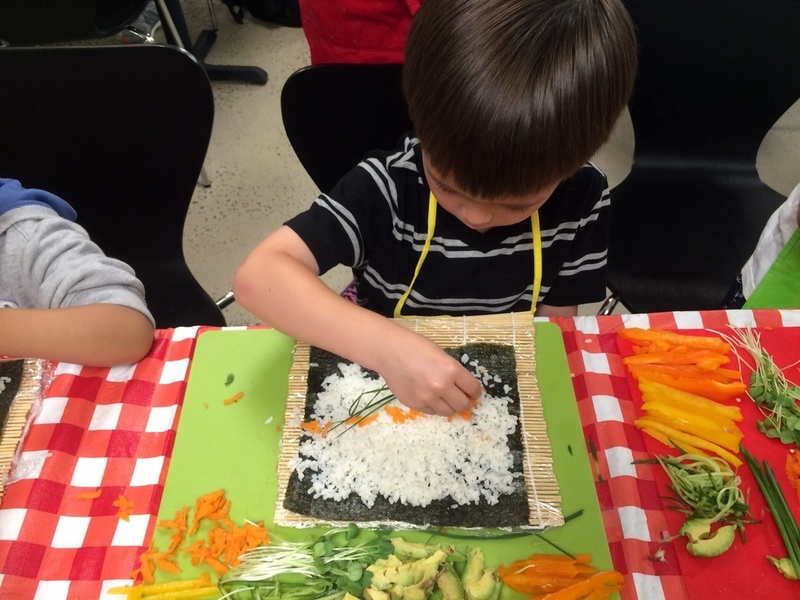 We cannot imagine a more fun and healthy way to eat your daily serving of veggies than with some home made sushi! Sushi originated in Southeast Asia as a method of keeping meats and fish from spoiling (although our sushi recipe is vegetarian, many other recipes contain some sort of meat or fish in its center). As sushi increases in popularity, chefs are becoming more creative with their combinations inside of the roll. Our recipe allows you to be the chef by choosing an assortment of colorful vegetables to include. Paired with soy sauce, it is bound to be delicious! 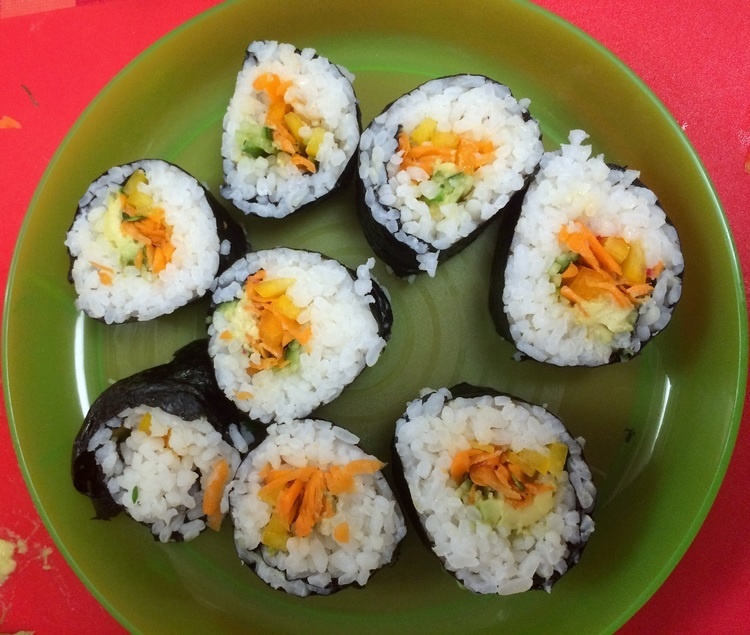 Yields: 4 cups of sushi rice, approximately 4-6 sushi rolls. In a strainer, rinse the rice well with cold water until the water running off is clear. Combine rice and water into a large pot on the stove and bring to a boil. Turn heat to low and cover. Simmer for approximately 15 minutes, or until rice is tender and all water is absorbed. Remove pot from stove and set aside to cool. To speed up the cooling process, gently spread cooked rice out on a baking sheet using a wooden spoon and let sit until it comes to room temperature. While rice is cooking, combine vinegar, sugar, and salt in a small saucepan over low heat. Once sugar and salt are dissolved, about 1 minute, remove from heat and set aside until rice is cooked and cooled. Pour vinegar mixture evenly over the cooled rice, gently folding rice with a wooden spoon to coat evenly. Place a sushi mat on your working surface with a piece of plastic wrap on top to keep the rice from sticking. Place a sheet of seaweed over the plastic wrap. 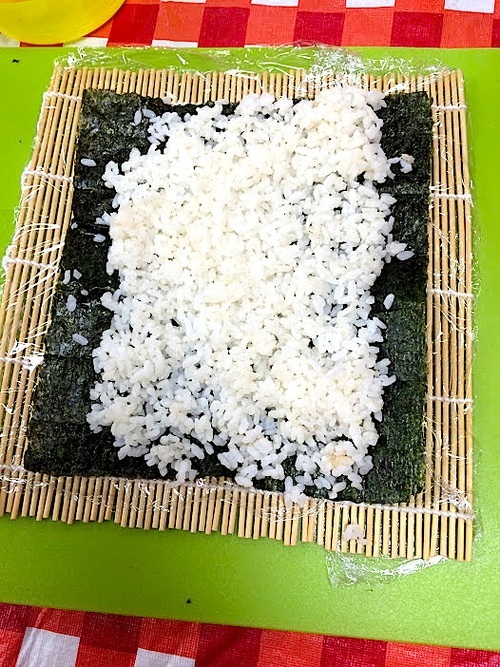 Using your fingers, spread approximately 3/4 cup of cooked rice evenly onto the sheet, leaving about 1/2 inch of empty seaweed at the top and bottom. 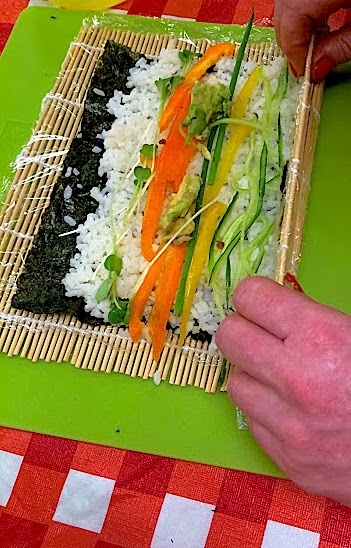 Place strips of vegetables across the center of the rice. 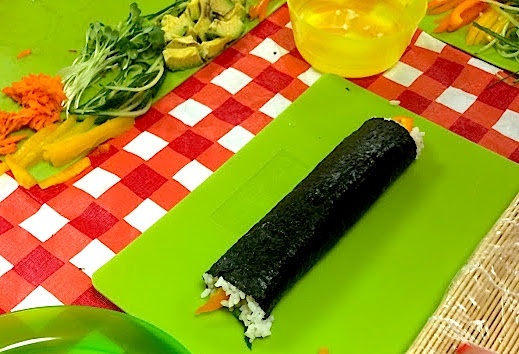 Lift the bottom of the mat to roll the nori over the vegetables once and press down to tuck the roll. Unroll slightly, then lift to roll again to create a tight roll, delivering pressure but not too much as to squish the roll. With about 1/2 inch of nori left, moisten the bare top strip of nori with a little water to help seal. Finish rolling and remove mat from roll. Set aside and continue with remaining nori sheets, rice and fillings. Slice each roll into 5 or 6 slices. Serve immediately with your favorite sushi condiments, such as low-sodium soy sauce, pickled sushi ginger, and/or wasabi.